Spiritual Connection in Daily Life, by Lynn Underwood, introduces sixteen simple questions that invite us to become more aware of experiences such as deep peace, joy, sense of inner strength, and giving and receiving love. The questions form Underwood’s Daily Spiritual Experience Scale, used in hundreds of studies and projects, translated into 40 languages, and used for years by counselors, therapists, nurses, clergy, and social workers. 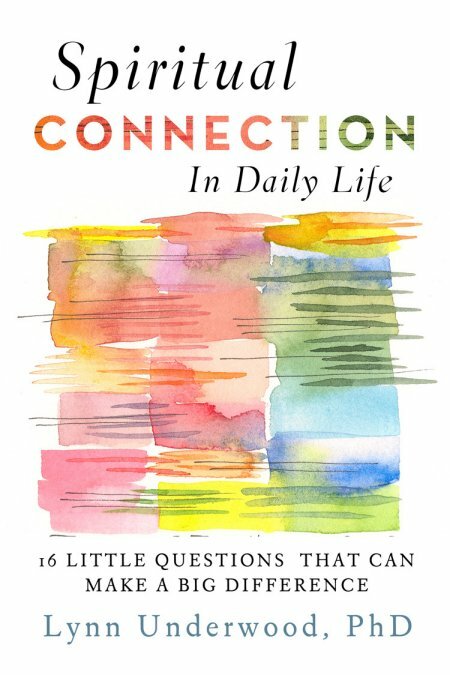 Spiritual Connection in Daily Life offers a step-by-step guide to using these questions to cultivate richer, deeper, and more satisfying lives. People with many different kinds of spiritual beliefs will also find a common language for communicating with others about the role of the “more than” in their lives. Book of the year selection for 2013 by Spirituality and Practice. Read a newspaper review of the book here.